The highway cleanup project inspired a film about the cleanup and life of Leelah Alcorn. ​ “Leelah’s Highway” is a profound documentary that takes a look at the lives of transgender youth and their experiences with the controversial topic of conversion therapy. "Leelah’s Highway" is a 24-minute HD documentary focusing on trans youth Leelah Alcorn. Isolated by her parents in their basement and forced to go through six months of conversion therapy, Leelah took her life on the highway near her house in Kings Mills, Ohio. She was 17. 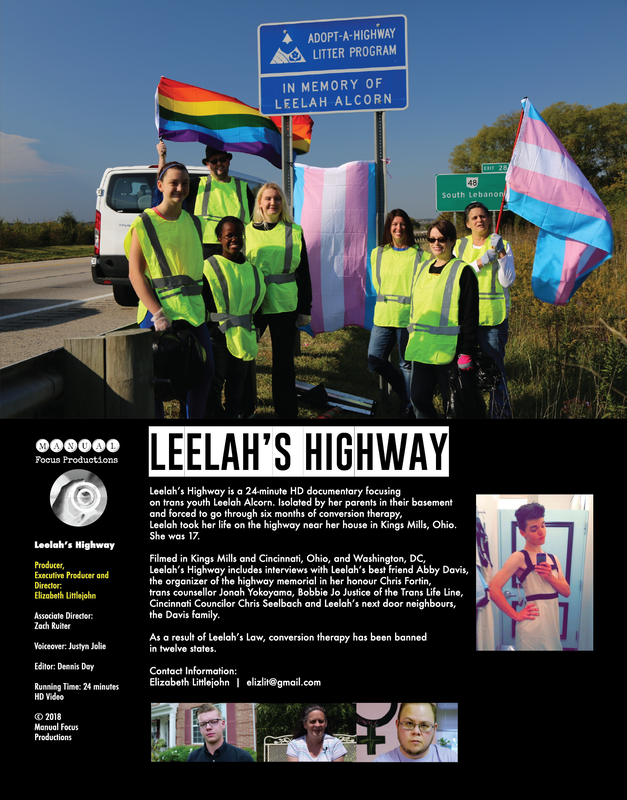 Filmed over two years in Kings Mills and Cincinnati, Ohio, and Washington, DC, Leelah’s Highway includes interviews with Leelah‘s best friend Abby Davis, the organizer of the highway memorial in her honour Chris Fortin, trans counsellor Jonah Yokoyama, Bobbie Jo Justice of the Trans Life Line, Cincinnati Councilor Chris Seelbach and Leelah’s next door neighbours, the Davis family. As a result of Leelah’s Law, conversion therapy has been banned in twelve U.S. states. The film had its premier at the Cindependent Film Festival in August 2018 at the Woodward Theater in Cincinnati and was nominated for Best Documentary. It was also recently screened at OutReels LGBT Film Festival in Cincinnati, Leelah's hometown. There are many ways to join us in our outreach to trans youth. In honor of the memory of Leelah Alcorn, we gather and make the world a better place. The story of the life of Leelah Alcorn and her last request to change the world. We organize community outreach and educational events about trans issues.